Life is better with fresh baked bread, especially if that bread is Weihnachtsstollen/Christstollen. As soon as I found out that the theme for this month's Bread Bakers was Whole Grain Holiday Breads I knew I was going to make stollen. 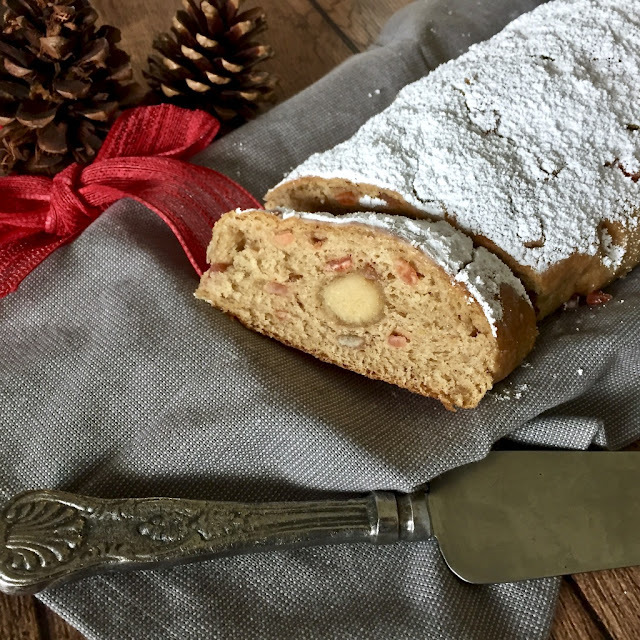 Stollen is kind of like a Christmas Fruitcake crossed with sweet bread, and oh so delicious. 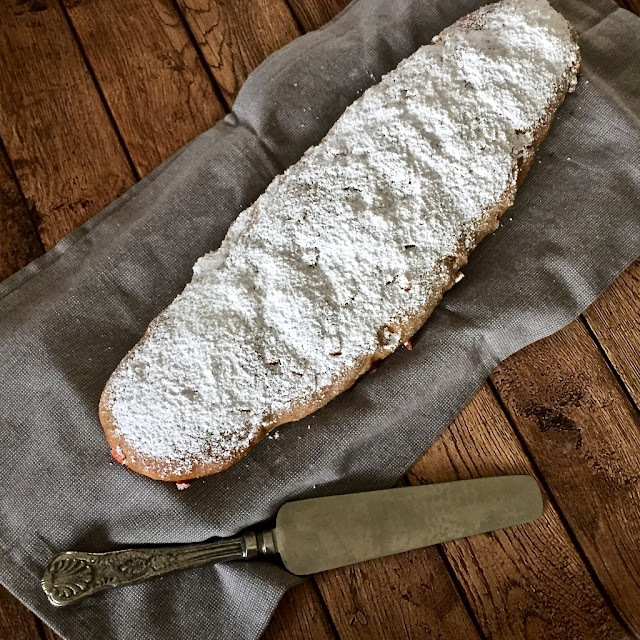 Stollen has a long history and was created over 500 years ago in the Dresden area of Germany. The dough is studded with spices, candied fruit and peel that has been soaked in alcohol, zest, and sometimes has nuts in it. Most are baked with an almond paste or marzipan in the center and dusted liberally with powdered sugar. It is traditionally baked during Advent and the shape of the stollen is meant to symbolize the baby Jesus wrapped in swaddling clothes. 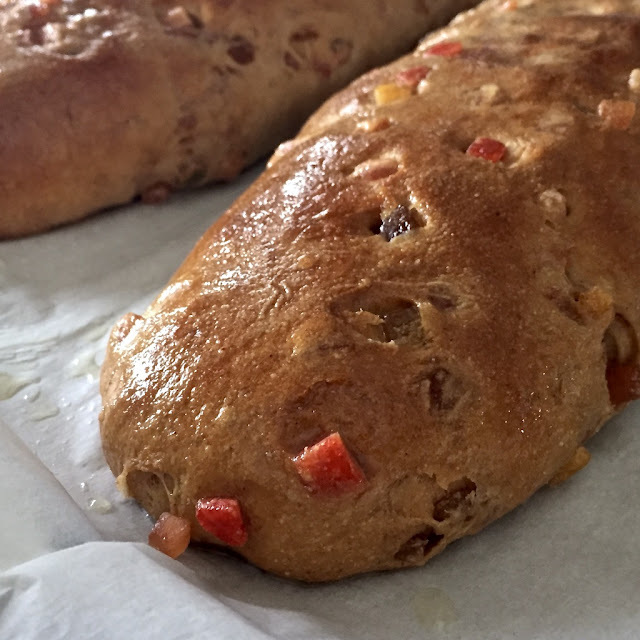 Besides this recipe sounding delicious and easy to make, it also makes two loaves - one to enjoy and one to share. At least that was the plan until we tasted it, and before we knew it, we had cut into both loaves. It was that good. I am sure I will baking it again soon, so it will definitely be shared then. This bread has just the right spice blend - cardamom, cinnamon, and ginger - and the candied fruit was the perfect choice. Of course if you do not care for candied fruit/peel you could use a combination of dried fruit, for example raisins, golden raisins, currants, cranberries, chopped apricots, crystallized ginger, or dried cherries. Also, don't worry if your loaf looks overloaded with fruit as it all comes together perfectly. When the loaf comes out of the oven it is brushed with melted butter and you can sprinkle it with superfine sugar and allow it to cool. Once cooled it is then dusted with powdered sugar. I choose not to sprinkle the sugar on it, but it is up to you. You could also leave out the almond paste if you don't really like it. Of course you will not get the golden seal from the Dresdner Stollen Protection Association for making authentic stollen, but you will still have a delicious bread and you may be making your own tradition. Combine the fruit and Marsala wine (or brandy), cover, and set aside at room temperature for up to 12 hours. Stir occasionally so that all the fruit gets to soak in the wine. Cut the marzipan lengthwise into two pieces and shape each into a rounded 50cm (20") log. 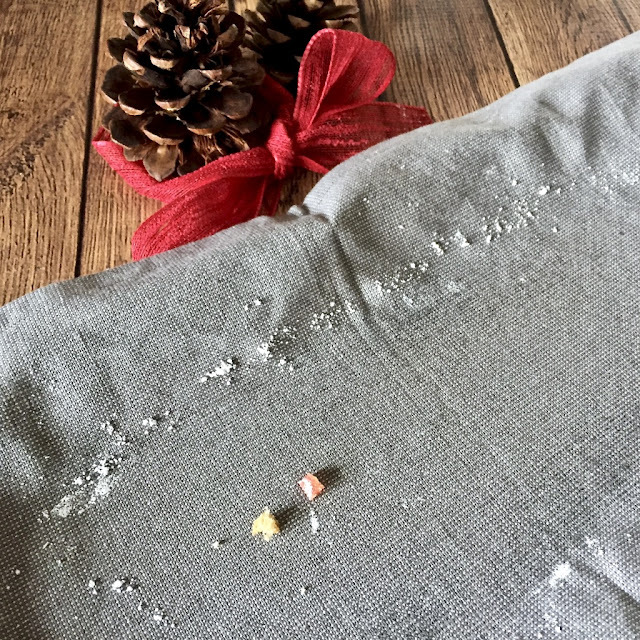 Wrap in plastic wrap until needed so that it does not dry out. Using a stand mixer, mix and knead together all of the dough ingredients to make a smooth, soft dough. Cover the dough and let it rise until puffy, about 60 to 90 minutes. Knead the fruit into the dough (I did this by returning the dough to my mixer and gently kneading it in with the dough hook). On a floured surface flatten one piece into an oval of 30 cm (12") long and 15-20 cm (6-8") wide. Place one piece of marzipan down the longer center of each oval, and fold dough over it lengthwise, leaving the top edge of the dough just shy of the bottom edge. Press the top edge firmly to seal it to the dough below. Place the loaves on a parchment-lined baking sheet and cover them: let them rise for 45 to 60 minutes, until puffy. While the stollen are rising, preheat the oven to 350°F, with a rack in the upper third. Bake the stollen for 30 to 35 minutes, until golden brown and its internal temperature reads 190°F on a digital thermometer. Remove the stollen from the oven, and brush them with melted butter. After 5 minutes, dust powdered sugar. Wrap airtight and store at room temperature for up to 2 weeks or freeze for longer storage. We take turns hosting each month and choosing the theme/ingredient. 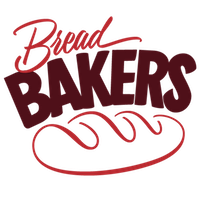 This month's Bread Baker's theme is Whole Grain Holiday Breads and is hosted by Stacy from Food Lust People Love and Kalyani from Sizzling Tastebuds - mahalo ladies! 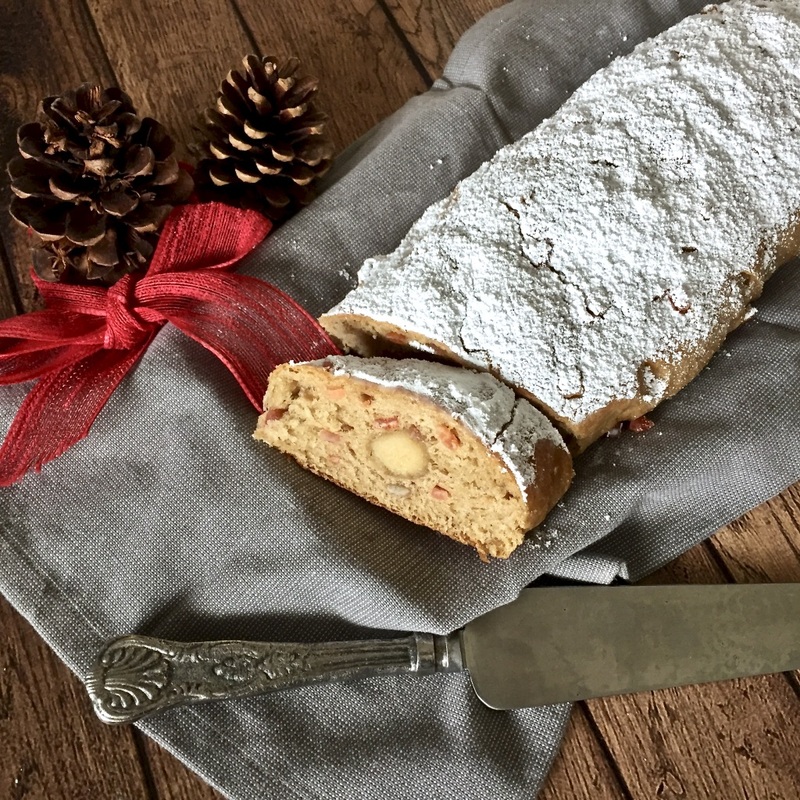 Love Stollen bread, thanks for sharing this recipe. Your stollen looks perfect. I love the idea of using whole wheat flour in this bread. And Marsala! Yum! That is a beautiful looking stollen. Doesn't look like it's made with wholewheat flour -- it looks so tender and delicious. that bread sounds so Chrismassy ! and loved the topped sugar too ! merry xmas to you and your family, Felice ! A delicious looking Christmas bake. I've yet to try baking a stollen.